The all-new Mazda CX-5 brings car and driver together like never before. Now available at Arnold Clark. Mazda’s unique KODO design language makes driving the new Mazda CX-5 SUV a truly enjoyable experience. Using the Japanese concept of ‘Jinba Ittai’ (meaning a feeling of oneness), everything is built to create balance and harmony. From its capacious interior to its innovative connectivity, the CX-5 is crafted for comfort and enjoyment. The CX-5 is built around you, from the rear reclining seats to the Mazda MZD-Connect infotainment system, the journey is pure pleasure. 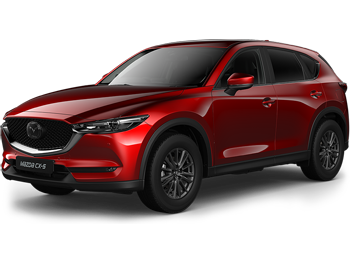 The all-new Mazda CX-5 is fully equipped with i-ACTIVSENSE safety technology, with in-built camera sensors to monitor and predict potential problems. Gives you the ability to set the speed of your car, whilst sensors judge distance and adjust your speed automatically. Always know how close you are to other cars. Alerting you via a light in your door mirror if nearby vehicles are detected. Sensors monitor the proximity of cars and keep you within speed limits, activating brakes for an emergency stop if necessary. Lets you know if any vehicles are approaching from the side when you're reversing, with millimetre precision. Choose from a range of city-smart colours that will get you noticed, wherever you go. The Sport Nav trim steps up the style, with engine options up to 175ps and lots of extra touches to give your driving the edge.